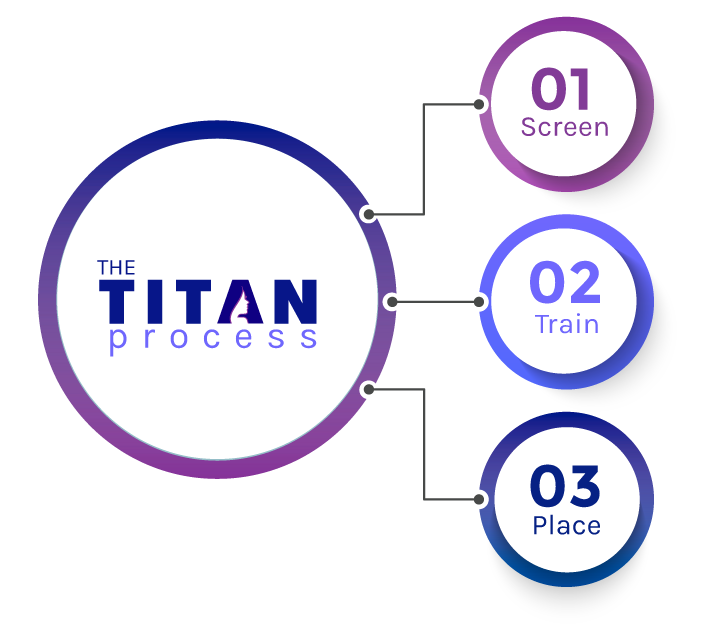 You can become a “TITAN” when you pass the screening portion of the TITAN Process™. A brief online quiz and then a 1 hour phone interview helps us determine if you have the aptitudes necessary to become an aesthetic injector. Plus, it helps the team know more about you and what type of employment opportunity will be right for you. Already an injector? We screen you as well just to show employers why you’ll be a great employee! When you want to become an injector, it can be confusing to find the right training to help you reach your goal. TITAN takes the guesswork out of the process since all TITAN Candidates are invited to take the TITAN Foundational Training CME course. Advanced injectors, we have an entire list of training companies that offer great courses for the experienced injector as well! Check out the TITAN Training Network and our Advanced Training opportunities! The team at TITAN works across the country to find the right job for you. Whether you are new to injecting or an experienced clinician, TITAN can help you find full time or part time positions. Plus, once you are placed, the TITAN team creates a unique Integration Plan so you have a 6 month “roadmap” to help start your business. TITAN wants to be sure you have all of the tools you need to successfully build your practice and the TITAN Integration Plan will support you on the way! Why should I use TITAN Aesthetic Recruiting rather than just sending out resumes? How do I start working with TITAN Aesthetic Recruiting? Why do you have all candidates participate in the TITAN Aesthetic Screening™? Do I need training before I work with TITAN Aesthetic Recruiting? How much does it cost for me to work with TITAN Aesthetic Recruiting? What benefits are available once TITAN Aesthetic Recruiting helps me find a job? The TITAN team has years of experience working in the aesthetic industry and understands the skills and aptitudes that are desirable in good injectors. We have a process of screening and training that helps credential you to employers looking for injectors. The TITAN Process™ supports you throughout your job search and increases the odds of finding the right position to match your needs. You want TITAN Aesthetic Recruiting to find the right job for you, so we start with a conversation to clarify the type of position that interests you. We want to know about you, your geographic preferences and the type of practice that is comfortable for you. If we can assist you in your search, we will then schedule the TITAN Aesthetic Screening™ to begin the process of helping you become a TITAN! Both experienced and new injectors benefit from the TITAN Aesthetic Screening™ because it helps potential employers know more about you. A great employee will have strong communication skills and become an integral part of the team in addition to having injection skills. The screening is a easy process that allows a medical director or business owner to know more about who you are as a person, but also helps the team at TITAN be able to not just find a job for you, but a job that is the right fit. The great “catch-22” in aesthetic injecting has always been that employers want trained injectors, but it is very hard to get training if you don’t have a medical director! Some programs that are advertised are very expensive and some are too broad. At TITAN Aesthetic Recruiting, we believe you should go to training only after you have a potential position. You will then complete the TITAN Foundational Training Course coordinated by Aesthetic Advancements Institute. By training directly before starting your new position, your new skills will be fresh in your mind and you’ll be ready to treat patients right away. TITAN Aesthetic Recruiting asks all candidates with little or no injecting experience to take the TITAN Foundational Training course prior to finalizing a job offer. This course is administered by Aesthetic Advancements Institute and the cost is approximately $2500. Once you are hired, you will always have the option to take additional advanced courses at a discount due to your status as a TITAN! TITAN Aesthetic Recruiting will work with you and your new employer to provide a customized Integration Plan. This plan will ensure that you have the tools and resources you need to begin your new injector position. It also provides a step by step suggested course of action to help you build a patient base and to fill your schedule as quickly as possible. Additionally, all TITANs receive discounts on aesthetic conferences and reduced fees for many advanced training courses. Check out the Advanced Training page for more information!